As I was brainstorming and pulling together the new look for the blog recently, I started thinking a lot about complimentary typefaces while choosing a couple for May Richer Fuller Be. Not to be dramatic, but they can make or break the look of something - whether it's a brochure, website, company logo, etc. Typefaces (or fonts) evoke a certain feeling and it's important to choose ones that represent what you're doing well. When you're in a creative field like blogging and design, there are some questions you (I) need to consider like: What looks good together? What doesn't? What looks professional? Does it reflect me and my style the way I want it to? Who is my audience? Now I don't claim to be a professional graphic designer, but I've learned a thing or two along the way as I've put together client projects and my own, and I thought it would be a fun exercise to try and pair together ten complimentary typefaces. It was harder than I thought, but I loved getting to play with fonts I don't normally get to use! It was easy to come up with the first five-ish, but after that it got a little trickier. The list you see at the top is my final list. What do you think? Do you have any favorites? Typography can be really fun to play around with - all you have to do is start! Feel free to steal any of these combinations you see above. I think a lot of them would be great on invitations, blogs, ads and cards among other things :). Many of the ones listed above are free to download (check the fine print on commercial vs. personal use) - just Google the names. Some are also pre-installed on your computer, so check there too. In case you'd like to see more typeface combinations like these, head on over to my Graphic Design Pinterest board. There are lots mixed in there! I love your Graphic Design board on Pinterest! Thanks for sharing! 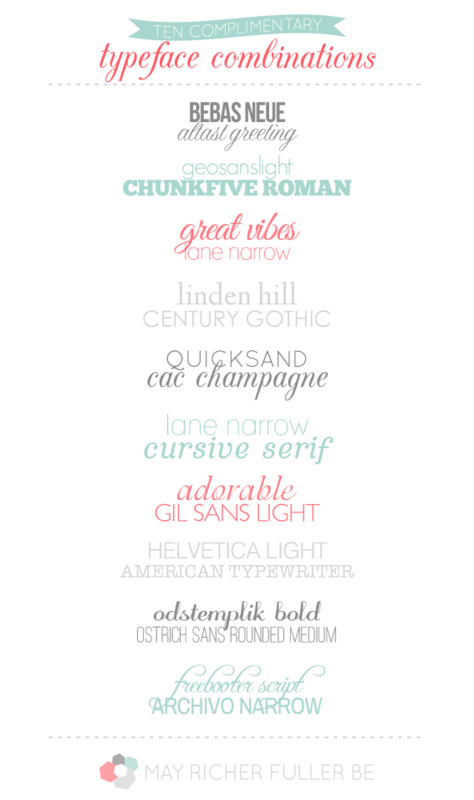 Great tips - I am always looking for fonts that go well together. So fun! I love fonts. :) Your new site looks amazing! !